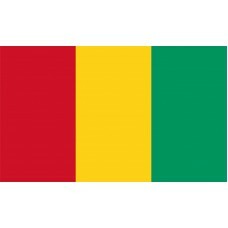 The flag of Guinea like many African country flags features the colors red, green, and yellow. The colors sit as vertical bands alongside each other and are of equal width. The bands start with red on the left, which represents the struggle and blood shed for independence, then yellow in the middle, representing the sun and the riches of the land, and then on the right there is the green band representing the green of the land. 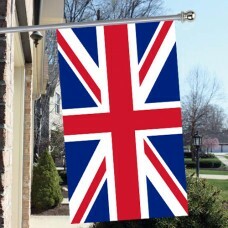 There are no other markings or symbols on the flag. 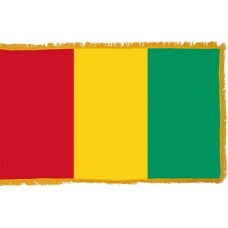 Guinea was once ruled by France, hence the three vertical bands creating a tricolor as a nod to the French flag that was once flown in the country. 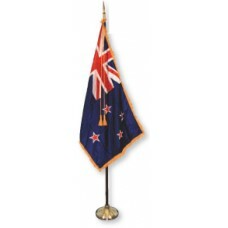 The country's Independence was gained in 1958 which is when this flag was adopted. The country is located on the western coast of Africa and was formerly known as French Guinea and its official title today is Republic of Guinea. Sometimes it is also referred to as Guinea-Conakry to save confusion with other countries in Africa using the name such as Equatorial Guinea (Central Africa) and it's direct neighbor to the north - Guinea-Bissau which is quite different in many ways having been occupied by the Portuguese in the past. The country of Guinea is a predominantly rural area comprising of mountains, rivers, savannas and jungles. With major rivers such as the Niger, Gambia, and Senegal having their origins in the country along with twenty-two other rivers and the high rainfall, you can understand why the land is so green. In fact, the capital city of Conakry is said to be one of the wettest capital's in the world with around 134 days of rain each year. Many parts of this mountainous and jungle clad country are protected, around 35% in total in order to preserve the unique flora and fauna and their natural habitats that can be found here. There are three national parks including the UNESCO World heritage site of Mount Nimba which also covers parts of Cote d'Ivoire. The highest point in Guinea is found here and reaches 1,752 meters. Another spectacular natural site to be found in Guinea is the Kambadaga Falls, which comprises of three separate cascades and the jungle surrounding it is full of colorful birds and monkeys as well as many other important animal species. This richness of soil, abundance of water and the favourable climatic conditions does also mean that Guinea has the potential to grow its agriculture and fishing industries once again. During the French colonization and at the start of its independence there were high levels of production of bananas, coffee, peanuts, and palm oil which gave the country wealth, but unfortunately this fell off during the socialist years and with recent political unrest. Building on this potential could bring the much-needed wealth to make improvements to health, the economy, and infrastructure of the country to fully live up to the yellow band in its Guinea Flag.